We all want to get the word out about our nonprofits. And once in awhile, asking friends to retweet your content pays off. But if you're constantly hounding people, particularly strangers, to retweet your posts...you may be shooting yourself in the foot. Really? What's the harm in asking strangers to retweet my content? May get you blocked if you try it too often with the same people. Repeated pesterings for retweets is far more likely to encourage me to block your account, particularly if from my point of view you’re someone I don’t know asking me to help you do something I have little knowledge of. Put yourself in his shoes. If you were constantly pestered by strangers to post content unrelated to your area of expertise, how often would you actually oblige? 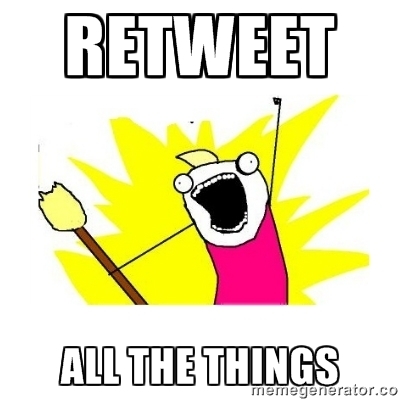 There are, however, more effective ways to ask for - and get - retweets. But use both these techniques with care, as they'll lose impact (and annoy people) if you use them too frequently. Direct Message (DM) close friends and colleagues with a friendly phrase like, "Hey [name]! Would you mind retweeting my post about [XYZ]? It would really help a lot." What's your take? What techniques have you used successfully to get your content retweeted?